Departure time: Sunrise or as early as possible to beat traffic on Highway 20. This is probably the longest single-day drive I recommend as it really does take a lot out of you, but it’s worth it. This is also easily one of our favorite group drives, but pick your group wisely. People often roll their eyes and just assume I’m old when I advise caution on drives, but Highway 20 bites hard when you get it wrong. The last time I did this drive some boulders had recently fallen onto the highway. And when I say boulders, I mean about half the size of my car; the kind that don’t move when you hit them. It’s also fairly busy in the summer months, so be wary of traffic. There are a lot of opportunities to pass here, but you don’t want that psycho in your group who tries to keep up and narrowly misses oncoming traffic on a drive like this. I call that out because there always seems to be some asshat on this drive. Anyway, onto the fun! We typically meet up at the local Arlington Safeway where gas is somewhat affordable and it’s really the last good stop before heading out Highway 530 to Darrington. This highway in itself is a lot of fun, but often crowded so don’t get too frustrated if you get stuck behind someone. It happens a lot here and there’s not too many passing zones, but enough to make it worth it. Just relax and enjoy the view. There’s a great little Kangaroo Farm (yes, you read that right) on the way out of town from Arlington on 530, but that’s a different trip. Keep going north until you hit Darrington and stop here for a good bathroom break if needed. It’s the last sign of good civilization until Winthrop. There’s a gas station on the corner you can’t miss if you need anything. From there hit the road to Rockport and Marblemount, and I mention it because you should take it easy rolling into Marblemount especially since it’s well known for being a popular speed trap. The next town, Newhalem, is a good optional spot to stop and get a few pics in front of the old train and there’s a cool little one lane bridge in front of Ladder Creek falls there you can sometimes drive on when it’s open. 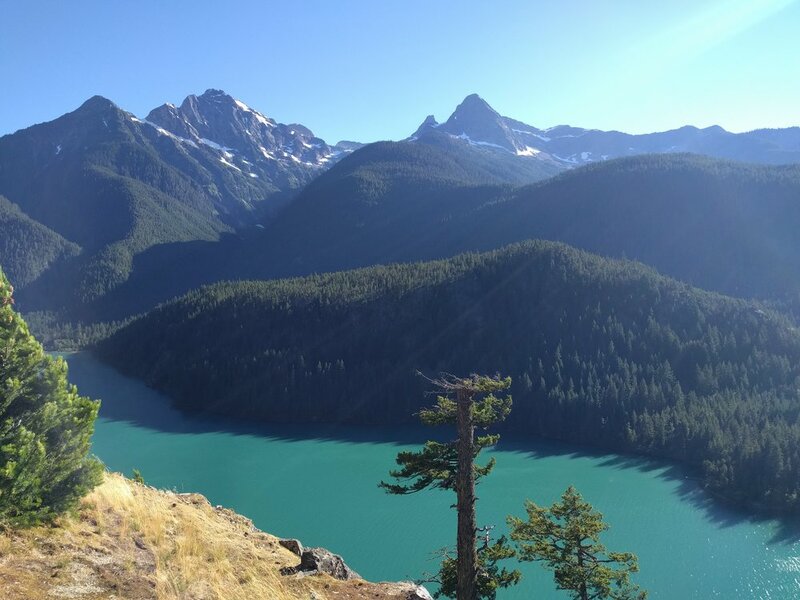 Your best stop on the drive for a view is the famous Diablo Lake Vista Point. When you see the lake take it easy going up the hill as it’s on a turn and you’ll definitely want to stop here. The lake is a gorgeous green that’s truly a sight to behold. When you’re ready get back on the road and continue you on to Winthrop. Take it easy, again, coming into Winthrop. Even 5-10 miles out the road straightens and makes a tempting high-speed passing zone, but you’ll likely have police waiting for you. Traffic is also common going into Winthrop so you’ll want to regain some patience here. There are some fun little shops and restaurants, but save your appetite for the next stop. The road out to Sun Mountain Lodge is a ton of fun even at “normal” speeds so have fun, but watch out for fisherman and tourists coming off the side roads. Take a look at the map before hand so you’re familiar with the road and you’ll be fine and have fun. The end of the road is the Sun Mountain Lodge where you’ll have amazing food and views and you may even want to stay the night. It’s a seriously beautiful destination and well worth the price to stay. As you leave Winthrop you’ll go through the little town of Twisp, but instead of heading south on Highway 153, take a little detour for a minute and get on the Twisp Carlton road for some fun. This curvy little road isn’t very busy and won’t cost you any time and you’re guaranteed to have more fun unless your Maserati blows a heater hose. Once you get back on 153 you can stop in Pateros for fuel and food if you need to or keep going onto Chelan for a bite at Stormy Mountain Brewing and Public House or any of the many wineries here. I highly recommend Hard Row to Hoe for fun, photos, and good wine. If you’re feeling sleepy it’s a great place to stop for the night and take a dip in the glacier fed blue water. If anything, just go look at the lake. Chelan is the 3rd deepest lake in the US at 1,500 feet and has some of the cleanest water in the world. It’s drivers choice on which side of the river you want to go on, but I prefer the east side when I’m heading south since it’s a better view of the river and hills. There’s a cool tunnel on the west side though. Anyway, keep going and then hit up Highway 2 into Leavenworth and have a bit at Munchen Haus, the best Brats in town. If you’re still feeling ready to party after all that driving then hit up 97 South after dinner. I’ll cover it more in “The Loop” but I LOVE this section of 97 or Blewett Pass as it’s often called. Watch out for deer in the evening here and I seriously mean it. I’ve almost hit several on this highway and they are no joke. From Leavenworth keep heading West on 2, but be patient here. Drivers on this road are a special kind of stupid to the point of making most of us homicidal until the passing zones. Just go into it expecting to get stuck, be patient, and wait until the passing zones. I’ve seen the risky passes here go bad before and when it goes bad, it goes really bad. Be patient. Highway 2 is a blast, but wait, there’s more! Instead of going straight through Monroe, take the lesser known Ben Howard Road to 203 and go into Duvall for a pint at the tavern before heading home.